Owning a car is a big responsibility. 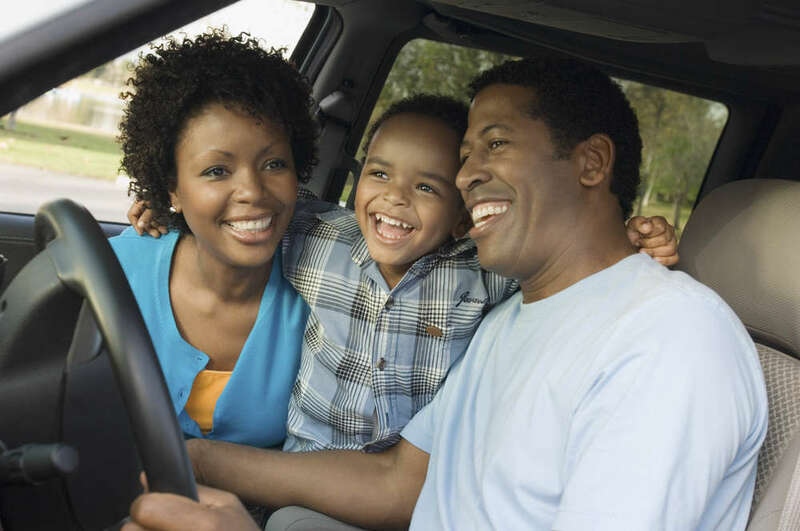 You probably take it to a mechanic when something is wrong, but there are benefits of maintaining the car on a regular basis so that you don’t spend a lot of money at one time getting something fixed. 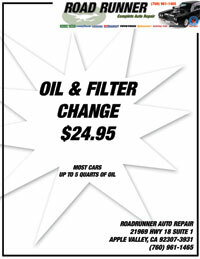 Road Runner Auto Care in Apple Valley, California, can help you stay on a schedule when it comes to everything from getting the oil changed to having the tires rotated. One of the primary benefits of routine maintenance from companies in Apple Valley like Road Runner Auto Care is that you’ll prolong the life of the vehicle. When the oil is changed, the brake pads are changed when needed, and the other fluids are changed as scheduled, then you’re car will have fewer issues than if you were to let these simple tasks go unhandled. You also want to keep the tires checked to maintain a proper air pressure, preventing a flat tire along with keeping an eye on the tread so that you aren’t driving on slick tires. The safety of your car is another reason to let Road Runner Auto Care maintain your vehicle. When issues are seen with the car right away, you have the time to get them repaired instead of letting them get worse. You don’t want to be on the road when something happens with the brake system, preventing you from stopping or if the fluids in the car are too low, which can cause the motor to not operate as it should. If you ever want to sell your car or trade it for another one, regular maintenance that can be shown from a company like Road Runner Auto Care in Apple Valley will make it easier to sell and help to keep the value as high as possible. When a vehicle hasn’t been maintained, it’s hard to get as much money for it because the buyer won’t know if there’s anything wrong or could go wrong with the car.